9 December 2014. Transparent communications, trust and active public participation are becoming increasingly important factors for the long-term success of biobanks. The idea of increasing the involvement of external stakeholders has recently been dubbed “biobanking 3.0”. Central to this concept is the need to promote understanding of biobanking and strengthen public acceptance. Against this background, the TMF work groups for biobanking and science communications met in Berlin on 2 December 2014 to exchange their knowledge and experience. Biobank operators, researchers and communications experts pooled their ideas and made concrete proposals for effectively raising the profile of biomaterial repositories and intensifying dialogue with donors. In biobanking 1.0, the focus was on the number of specimens stored. Biobanking 2.0 dealt more with the quality of the samples, fuelled by discussions on the reproducibility of results and rising costs. Biobanking 3.0 follows on from these developments and calls for a shift in perspective to increase the value and significance of biobanks for society (see Simeon-Dubach/Watson 2014). In order to gain insight into these valuable resources and understand how they can be communicated externally, a distinction must be drawn between population-based repositories, biobanks operated within the scope of registries and trials, and clinical biobanks at hospitals. Professor Michael Hummel from the Institute of Pathology at Berlin’s Charité hospital underlined the differences in the way data and samples are collected from patients and donors in clinical and population-based trials. Information on each type of biobank must be communicated in its own particular way. Andrew Trehearne, head of communications at UK Biobank, stressed the importance of building a long-term relationship based on trust between donors and biobank operators. Participants in the UK Biobank programme can visit the website at any time to find out how their biological material is being used and update their personal data. In addition, they can subscribe to a newsletter to keep abreast of all the latest developments. The German National Cohort (NAKO) recently launched a prospective population-based cohort study, the results of which will be representative of the German public. Julia Geulen, responsible for communications at NAKO, reports that a dedicated community will be established to maintain long-term contact with donors. A website, newsletter, chatrooms and get-togethers will provide information and encourage participants to engage in dialogue. Employers, doctors and other relevant figures in society will be involved in the project to support the recruitment of donors. The Competence Network for Congenital Heart Defects has launched a campaign aimed at young people who are part of the National Registry for these diseases. As Wiebke Lesch from the Competence Network explained, a Facebook page and a family fun weekend aim to strengthen communications between patients, their families, doctors and researchers. Moreover, research using biobank specimens will be presented in a way that makes it easier for children to understand. Biobanking plays an important role for the German Centres for Health Research – where acceptance and active involvement of patients are also key issues. Jörn Bullwinkel from the German Centre for Lung Research underlined that establishing trust is essential, in particular when patients and donors are asked to give broad consent in cases where the research purpose is not yet known. Professor Roland Jahns (ibdw, University Hospital of Würzburg) highlighted how the ibdw biobank already deploys a variety of materials and tools to raise awareness and promote trust. Activities include special events, trade fair visits, open days and panel discussions where the public is invited to play an active part. 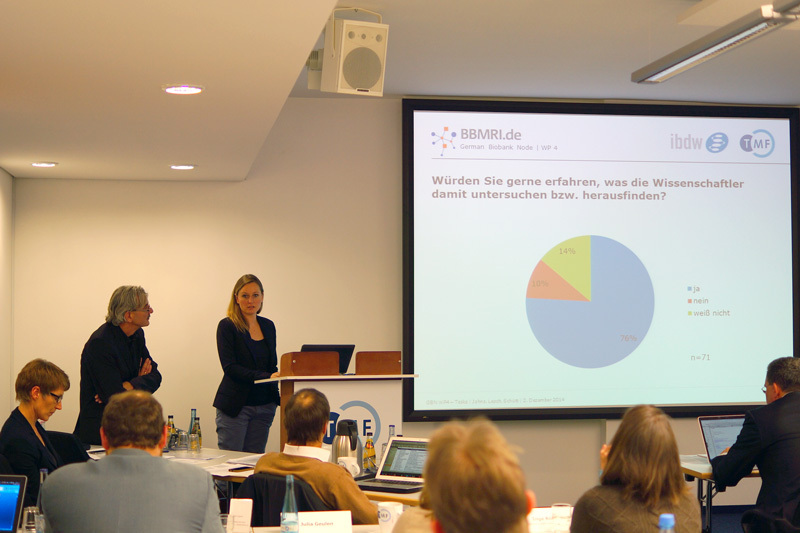 Wiebke Lesch presents the preliminary results of an ongoing survey. Communications and public affairs are also key aspects of the German Biobank Node (GBN) project. A strategic concept will be developed that aims to create a transparent, positive image of biobanking in Germany and to strengthen people’s trust in the creation and operation of these research resources. Wiebke Lesch and Antje Schütt (TMF) presented the preliminary results of an ongoing survey of patients who have consented to provide specimens. The results show that the majority of participants feel confident about donating blood or tissue samples to a biobank. However, in cases where patients are particularly unwell, they often have difficulty recalling the specific details of the consent agreement. Most of the donors stated their motivation for taking part was to support medical research with a view to improving treatment methods in the future. Only a small number were participating for personal reasons. The results of this survey and additional interviews and analysis will form the basis for developing the strategic communications concept.